Quality, not quantity, is the key to improvement by practice. Obviously, I'm a big believer in practice. But it must be proper practice. If you don't practice properly, you're really just wasting your time. And while I can offer you a series of practice drills to improve your game, I will preface this by encouraging players - recreational players, amateur league players and even advanced players - to seek out proper coaching. Coaching can really speed up your learning curve. When I first started playing, I was like most players. I thought I would get better simply by playing more. And I did gain most of my knowledge over the years just by playing and observing. But if I think back to those early days, I wish I'd have received coaching. I would have gotten much better much more quickly. It would have helped me be a better player mentally, and I would have been a better cueist. Of course, you need to find a solid coach. Too many coaches automatically overload players with drills. A good coach should watch you play for a while, so he can analyze your game. After that, he can strip your game down and start building it back properly. It is up to the individual player, however, to take it on board and really work on their game. Address areas you need to work on. Drills should focus on one thing. It can be a certain shot, or certain cue action. The great thing about good practice drills is that they allow players to see the progress in their game. You don't see that progress playing rack after rack. Players often struggle with drills at the start, but once you improve, you get immediate feedback. The sense of accomplishment makes you want to practice more. Again, the key to proper practice is quality, not quantity. If you practice and play for five or six hours, I can guarantee that two or three of those hours aren't really improving your game. It's too hard to maintain the focus required for quality practice. Over two or three hours you can keep your focus on the drills at hand. That will also help you in a match, where you need to maintain focus for a few hours. I usually start out with a few easy drills just to get my stroke in line. The drill in Diagram One is simple, but still the best way for me to know that my stroke is right. The object is to set up a short shot (1 ball) and shoot it into the corner pocket, drawing the cue ball straight back to the top rail. Try to make 10 shots in a row. Then move the cue ball a diamond farther (2 ball) and try the same drill. After 10 of those shots, keep the object ball (3 ball) on the same diamond and move the cue ball back a diamond. If I can complete this drill, I know my stroke is pretty solid. Another great drill is shown in Diagram Two. Shoot the 1 ball and stun the cue ball to the other side of the table. 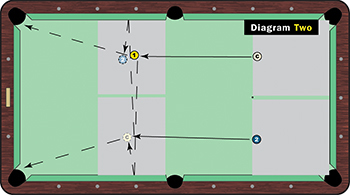 The cue ball must stay in the shaded area, on one side of the table, and between the middle diamond and side pocket. Take another object ball (2 ball), set it up in the shaded area above the spot and repeat the drill. Keep moving from one side of the table to the other and see how many you can make in a row. My best in this drill is 37 balls! After doing some drills like this, I practice some pattern drills. Then, I work on whatever game is going to be played at the next tournament. I spend some time on the break shot, and play a set against the ghost. When you play the ghost, you have to really want to win the set. It will help you concentrate through every rack. That's a proper practice session.